The Q, S & P model steel arch buildings, quonset huts and metal garage kits are ideal for agriculture business, farming equipment, feed, fertilizer and livestock. With wide, tall arched roofs the Q model and S model metal building kits and P model garage kits are most widely used in the agriculture industry for hay and crop storage, grain and commodities, livestock barns and farm equipment. Steel metal arch buildings are superior to traditional wood barns for various reasons such as lower cost, durability, and the ability to withstand severe weather conditions such as heavy snow loads, hurricanes and earth tremors. The space inside is also 100% usable with no rafters, or beams. This quonset hut style building is based of the original design used back in the 19th century for military use and then sold to farmers for agriculture. Choose the gauge steel you want and the length width and height available in thousands of sizes for 4 garage kit models. Width options are 16 to 100 feet wide and height up to 24 feet. Your agriculture metal arch building can be virtually as long as you need. With an easy to erect design, all you need to do is bolt the pre-engineered building system arches, angles and end walls together using supplied hardware and our step by step instruction manual on top of a solid cement foundation. Our trained customer service representatives are always here to assist you with your metal garage project. We will help you custom design, plan and price out your building based on your county’s building codes and needs. If you need a building plan to obtain a permit we can assist you! We provide our customer with comprehensive turnkey solutions from building plans, permits, land surveys, foundations, erecting your arch garage kit building, construction and interior planning and equipment vendors. At Metal Building Kings® we do more than just sell the best quality steel quonset hut building kits, we make sure your entire process goes smoothly so that you are happy with your purchase and experience with us. 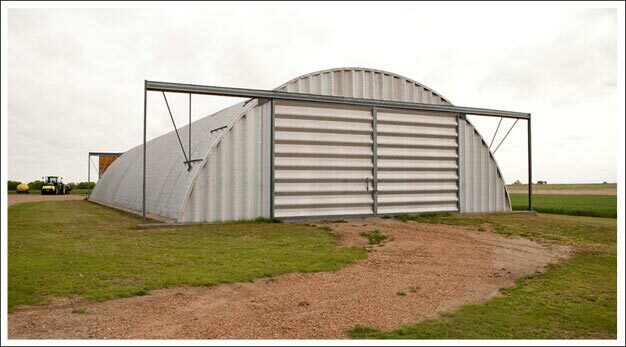 Customize your quonset hut agriculture arch building with overhead roll-up doors, walk through doors, insulation, ventilation systems, or windows. You can even customize your building end walls for practicality or appearance. Our agriculture customers often use manual slide doors for livestock because of the quiet operation. All our doors come insulated to maintain a climate controlled interior. Your Metal Building Kings® garage kit is manufactured with 14-22 gauge 80,000ksi tensile yield carbon AZ55 Galvalume® steel coated with aluminum-zinc alloy and silicon and a state of the art high quality silicone-protected polyester coil coating paint system to help prevent rust and comes with an industry best 40 year rust-through perforation warranty and a 40 year warranty against peeling paint, flaking an loss of adhesion.